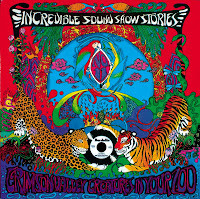 Up for your enjoyment is another volume of the fabulous Incredible Soundshow Stories. This one features psych bands from UK and Europe and, with the exception of Jacques Dutronc, are obscure at best. Sadly, in my humble opinion, this is one of the weaker ISSS volume. It may be because the general tone is more pop than psych. I specially resent the inclusion of "Hippie Hippie Hourrah" which is a very ironic & scathing song about hippies (you guessed it) disguised as psychedelic song. If you don't understand French, it can be enjoyable, if you do understand, it is a travesty and a bit of a joke. That said, there is quite a few popsyke gems on this LP, I just find this collection has been assembled in a rush… not quite the same quality and flow Dig The Fuzz used to offer. There should still be enough Belgian and Dutch Beatles/Floyd sound-alikes in there to make you happy. Thank you again for that Volume of this excellent serie.